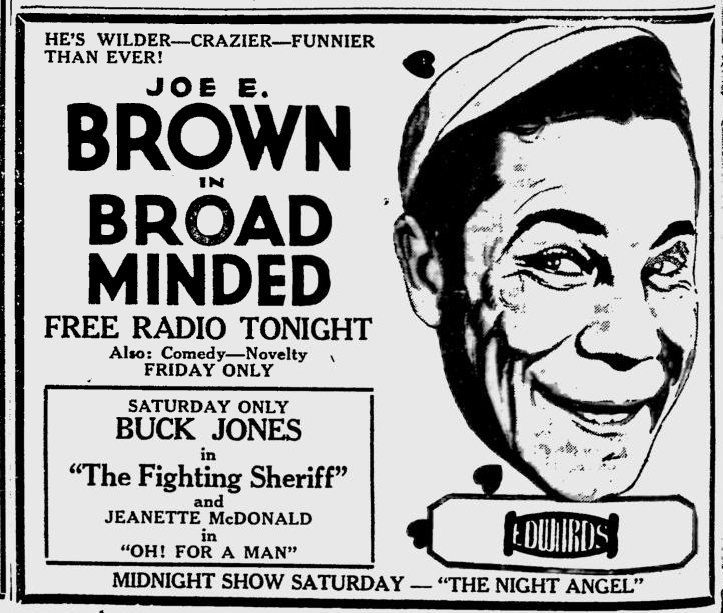 A comedy vehicle for First National’s rising star Joe E. Brown, although the film was originally slated to star James Rennie and Fred Kohler. 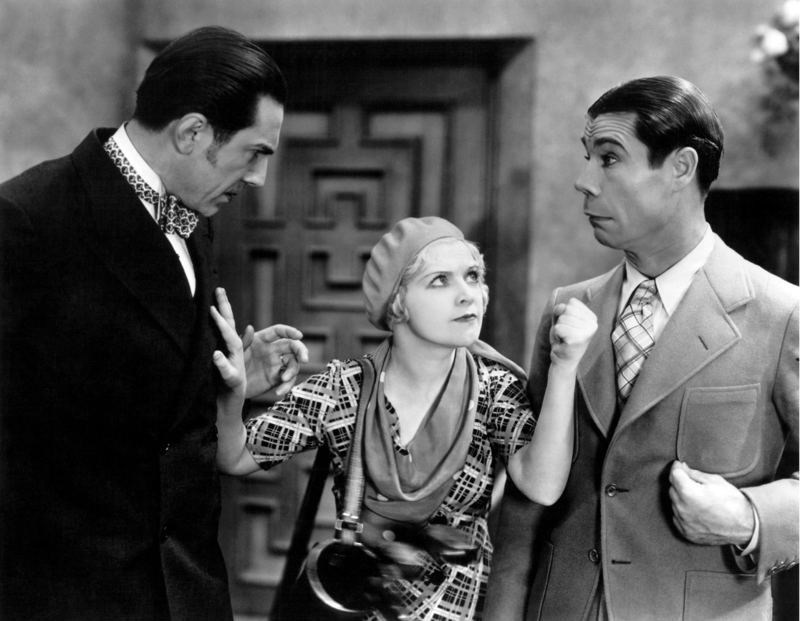 Bela Lugosi displays his fine comedic skill as Pancho Arango, a highly strung South American who finds himself constantly on the receiving end of the hapless Joe E. Brown’s unintentional faux pas．Despite his non-horror role, his Dracula image was played up in some publicity stills and mentioned in reviews. 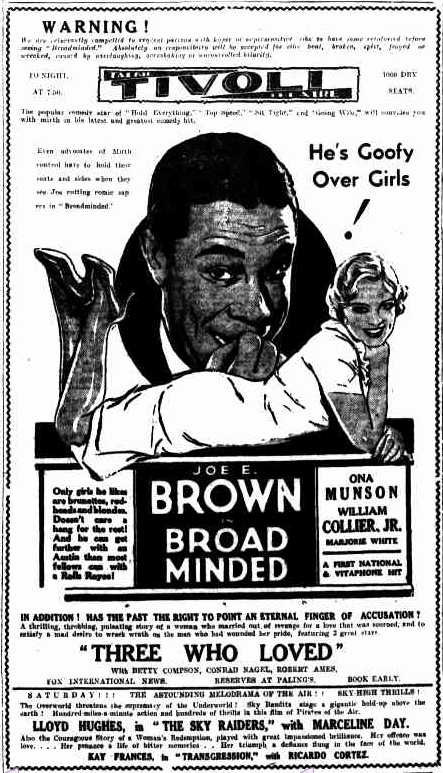 Holmes Herbert: John J. Hackett, Sr.
“Broad Minded” is the first story written directly into and around an actor’s face. 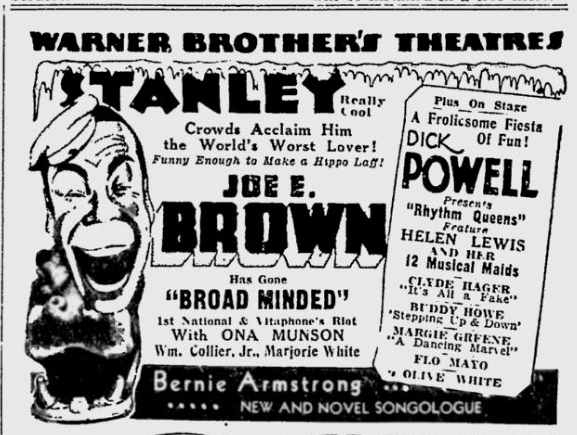 Exposure of Brown’s tonsils is all that is necessary to get laughs, but FN surrounds the Joie map with some pretty girls and customary comedy dressing. That fills this out into a big Brown picture. They’ll roar during many parts of this running time in every class of theater. It’s an exceptionally good comedy program talker. 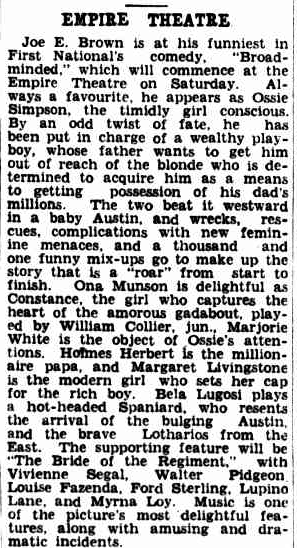 A baby party opens the story with William Collier, Jr., as a careless rich man’s son wheeling in the prize package. In infant’s hat and gown drinking hooch in the carriage, Brown here hits his fastest comedy pace. The police raid and the ride home in the milk wagon work in nicely a transitional trip which brings in the other characters. 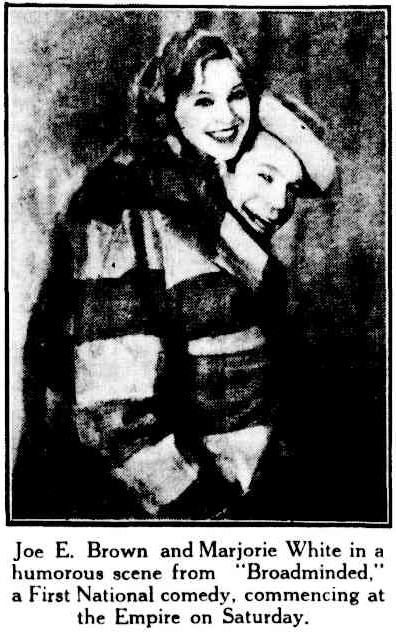 Ona Munson is found under an auto and her girl friend Marjorie White in the back seat beneath a blanket. 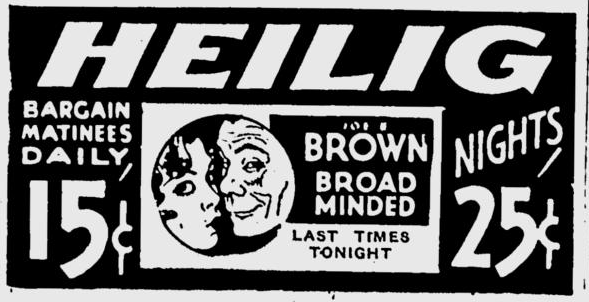 They follow through to a double marriage with Bela Lugosi retaining his “Dracula” mannerisms in a South American characterization erected for Brown’s further comic excitation. 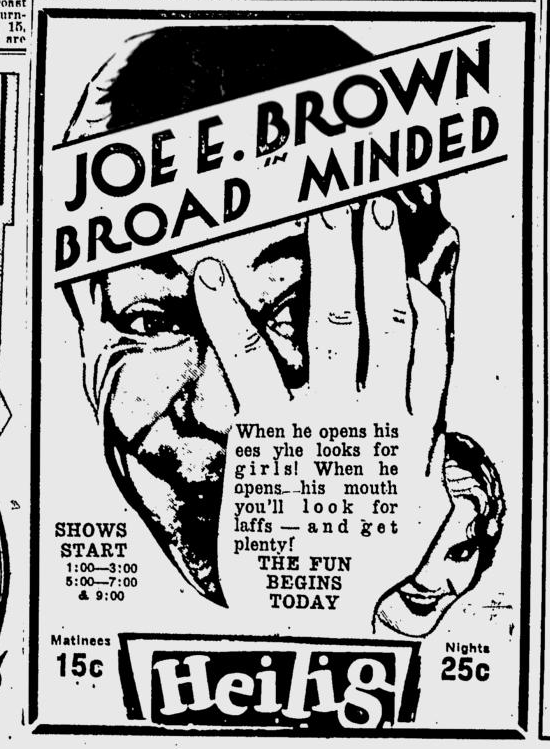 Imitating a gorilla, eating celery, showing an actress how to do the weeps, all give Joe Brown those chances to work that mouth, throat and eyes. 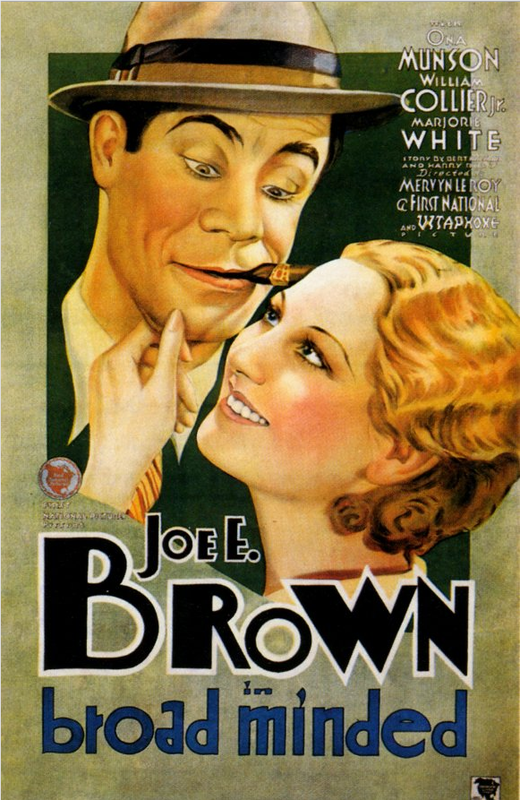 Joe E. Brown’s latest effusion is intended primarily for the Summer life of the country and for those who like their comedy—well, with Joe E. Brown. Categorically, the first will allow a multitude of sins and omissions and the second will find peace in tricks with fountain pens and baby cars. 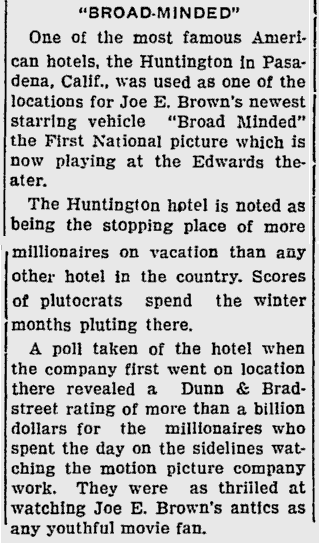 That there are considerable of both seemed to be shown by the laughter—mild, anyway—which greeted the varied incidents of “Broad Minded” yesterday. The Strand’s new occupant makes no pretentions beyond that of a program bit, with well-remembered situations and tried encounters between comic heroes and their fates. It is built around a series of misunderstandings, with letters and exposures and embarrassing circumstances. 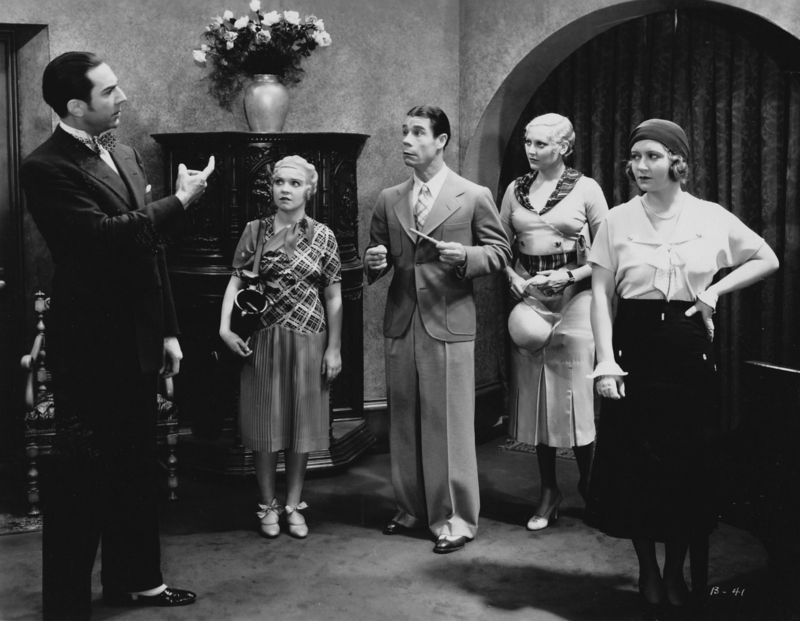 With half a dozen songs and a chorus it would be a musical comedy along the usual lines; nothing more Summery by nature than that could easily be found. 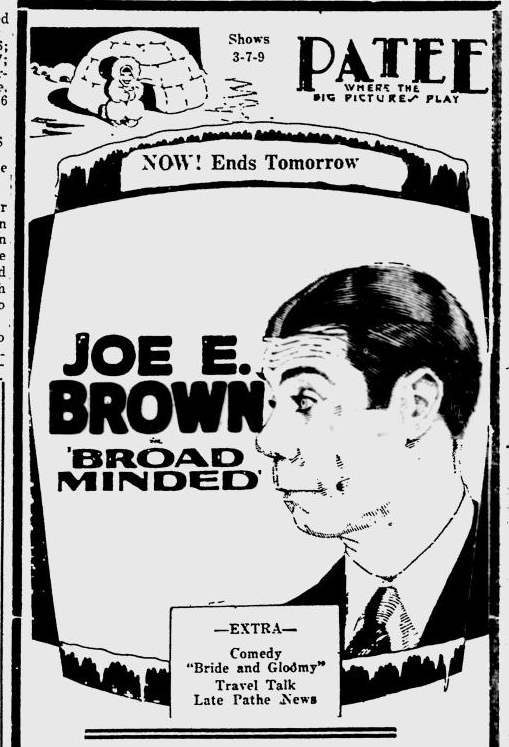 And Joe E. Brown is all of it; or vice versa. 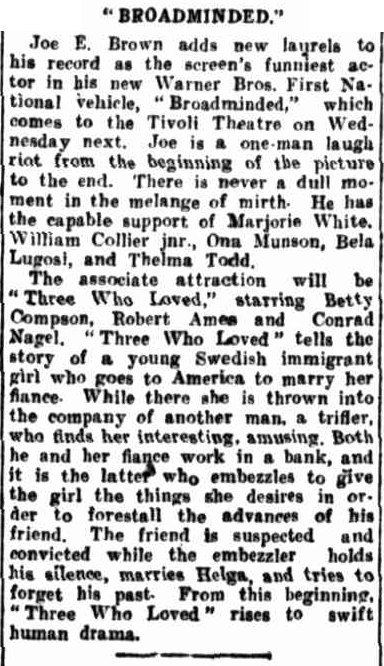 The story is about a gay young man and the even gayer young lady who wants to marry him. 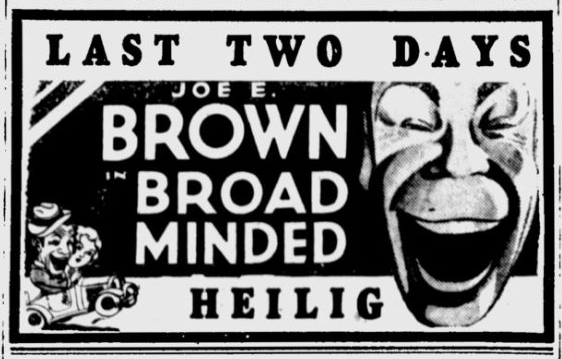 His father decides to send him away, putting him in the care of his cousin—in this case, Mr. Brown. The trip West is made in a baby car, and there are adventures of one kind or another on the way. Then love, and further complications, set in (as they will in California) but strained circumstances ultimately iron out themselves. Life goes on Again. 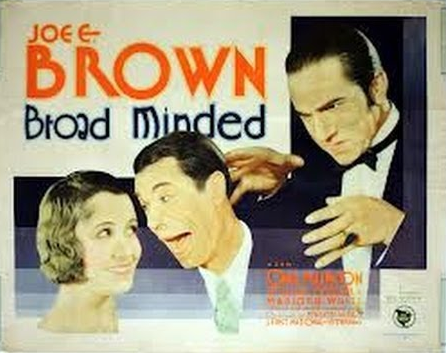 As the cousin, Mr. Brown plays in his usual boisterous fashion, although even he is not agile enough to keep up to some of “Broad Minded’s” more far-reaching climaxes. William Collier Jr. has the part of the gay young man, and at times seems a trifle out of his territory. Ona Munson and Marjorie White have the two main parts opposite them. But it is all very difficult. Life in California. 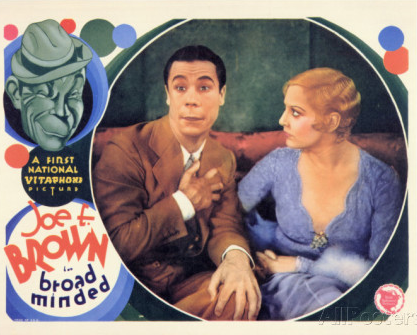 BROAD MINDED, based on a story by Harry Ruby and Bert Kalmer; directed by Mervyn LeRoy; a First National Picture. At the Warner’s Strand and the Brooklyn Strand. Jack Hackett . . . . . William Collier Jr.